1 How are the new Favorites different from the previous one? Open the content area. "Bus stop & Bus" Favorites have been added. You can instantly check information on buses that stop at your frequently used bus stops! 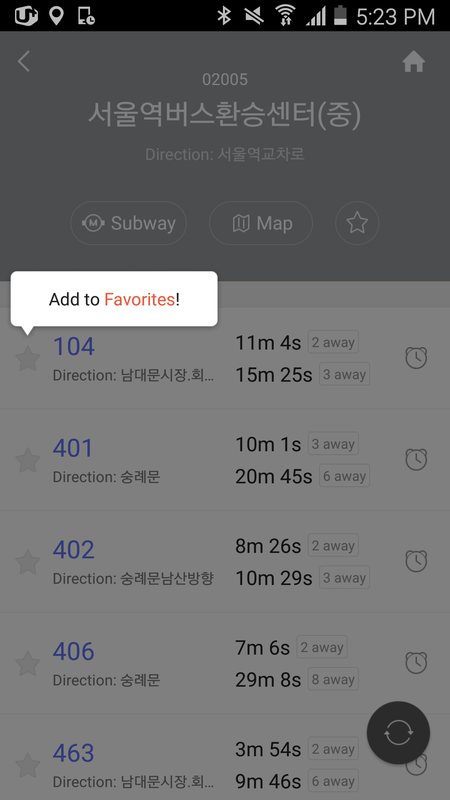 1) "Bus stop" or "Bus" Favorites: Tap the Favorites button on the top of the page. 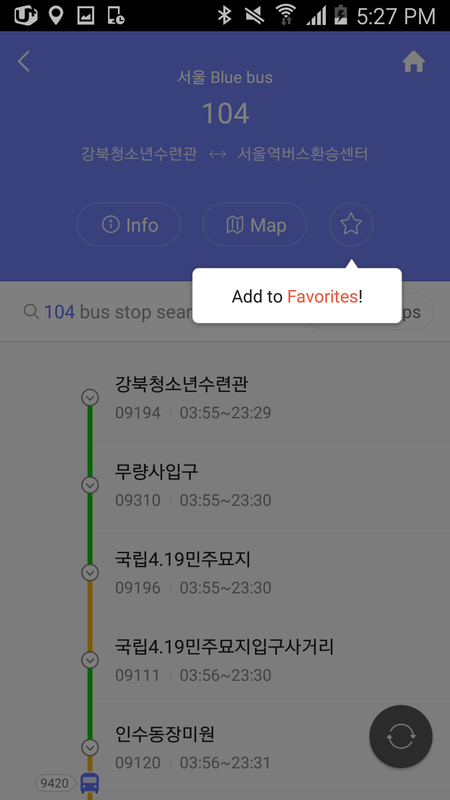 2) "Bus stop & Bus" Favorites: From the designated bus stop page, tap the Favorites button right next to the bus of your choice. 2) Go to the side menu and select Edit Home to rearrange the order, edit or delete your Favorites. ► How many Favorites can I save? You can save up to 50 "Bus," "Bus stop," "Bus stop & Bus" Favorites. In case of "Bus stop & Bus" Favorites, up to six buses can be added for a single bus stop, allowing you to save arrival information for up to 300 buses. 2 How do I use 'Suggestions'? Open the content area. Suggestions offers a variety of bus-related information based on your current location. - Direct Bus to Home: Buses that go directly to the bus stop nearest to your home. * Don't forget to set up your home location before using this feature. - Kakao Taxi: Lets you request a ride using Kakao Taxi using your current location, offering you an option if there are no buses available. From the side menu, go to Edit Home > Suggestions and activate/deactivate the Suggestions feature. 3 What is a 'Bus Arrival Notification?' Open the content area. The schedule alarm comes in handy if you ride the bus at the same time every day. Tap the side menu and select Bus Arrival Notification. Tap the + button on the upper right corner and select Choose from Favorites and set up a time and day. * You need to have a "Bus stop & Bus" Favorites already added to your Favorites list in order to set up a notification.